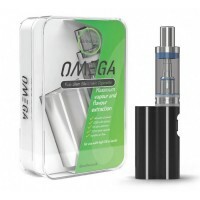 The Omega is an ideal kit for those who want to upgrade from a conventional eCigarette to a MOD. Unlike other MOD eCigarettes, the Omega functions using a single button making it very easy to use. The power is optimised at a fixed 40 watts which produces an ideal amount of vapour. All you have to do is determine how much vapour you’d like to inhale by using the adjustable airflow ring and then simply press the power button to vape - it’s really that simple.